Hello all, I managed to come across a fairly well maintained 88 MJ. My goal is to build the most reliable mj I can possible build. I am not totally sold on the 30/44 set up. I would like a little wider, bigger brakes and stronger. I was considering 1/2 ton axles. I am curious if I should even consider this route. or should build a HP30 and D44 with upgrade parts. My biggest question is that are these axles built or a stock 1/2 ton axles stronger ? my goal wheel size is 35. big part is that this is also going to be a DD. Any recomendations? Never had any problems with my 8.25" locked running 35" tires, so a 44 should be fine with them also. As a matter of fact, my 79 Ford full size pickup had a D44 rear axle. The D35 is a problem, though. You could get chromoly shafts and CTM u joints, but you're still stuck with the unit bearings. And these unit bearings DO NOT LIKE 35" TIRES. Even if you pay $1K plus for a Rubicon D44 you still have the same unit bearings. I myself am in the process of putting a high pinion D60 up front and a Sterling 10.25" in the rear, keeping both full width. But I'm also moving up to 37" tires for now with the final plan being 42 or 44" tires. RIght now its 2wd with a D35 in the rear. I am still weighing options for a Tcase. 231 or sourcing a D300. a D44 full size would not be bad. or a 9in if i can pick one up cheap. I am just not sure which front axle. which side the diff shold be on and hp vs lp or rotation. so on. What about a WJ knuckle swap with spacers? any reliability issues i can run into? Using an MJ as a daily driver is incompatible with running 35" tires. Make up your mind. Kind of a vague question. You say DD but what about offroad? Will this be a mall crawler or a southern rock bouncer. A D30/D35 can be built to run 35s on the street. D30/D44 combo is a pretty good one for 35's. till they really need to make the jump to front D60, D70/14 bolt rear & tires that don't mind losing that much ground clearance. the later ujoints are beefy. unfortunately, the axle shafts are NOT. as far as rear axles, I had 35's on my MJ with d30 and mj d44 rear. never an issue with the rear, but anyone who tells you 35's are OK on a dana 30 is either the luckiest SOB on the planet, or doesn't know what the hell they're talking about. The D300 is nice & strong, but you could have a clearance issue with the exhaust pipe since it runs on the pass side. which hurts axle droop a bit. but MJ's don't really need more rear shaft length like most other Jeeps. The 231 is good because you can use off the shelf driveshafts shifters, etc. there's no stock passengers side high pinion axles (30's or 44's) so the stronger 300 t-case usually means running a low pinion 44.
unless your planning to run a 3 link set up. I vote for the bolt in 231, HP 30, and an 8.25, 8.8, or 44 rear. aftermarket ft shafts are a good compromise. but blown u-joints can take out the axleshafts, lockers, and even balljoint/knuckles. than putting the knuckle back together in the middle of an obstacle. Eagle: sorry about being vague, but its for DD for work and back only about 10 miles or so but more so for Expo type camping. where i live its about a 6 hour drive to get to anything you cna really get away from people. Mnkyboy: i will be wheeling.. not very hard but i will have a bit of weight as i am assuming this will get packed down for a week or so camping. I am also hoping to be able to tow a 23ft boat. Jpnjim: I am actualy looking for overkill if it won't break the bank. i was just looking for info basically cost between a built 30/44 set up vs stock regeared full size axles. thank you for the info it was pretty much the questions i have had and didnt know i would have answered in one shot. sorry if i am asking vague questions, but i have not actually gotten my jeep in hand yet. i am currently deployed and trying to set up plans for when i return home. oh i only make mention of 35's cause that would be the higher limit of my options now. i am still debating between 33-35in set up. i had a cherokee once upon a time with 37's, but it was short lived. yes i bought it built, i won't take credit but it didnt last long due to orders and couldnt bring it with me. that set up was an mj44 and d30 but it was very built up. one last question then how much wider would an 8.8 or waggy axle be than the 35? 8.8" is a little narrower and a waggy is a little wider. 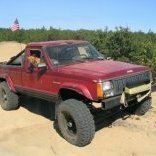 For an expedition rig I would do 33s with an XJ non cad D30 with 297 jounts and a Xj/MJD44, Ford 8.8", or XJ 8.25 with 29 spline shafts and be done. yeah i think thats what i am gonna aim for. an 8.8 for the rear and an hp30 for the front end or if i come across some waggy axles cheap. thanks guys. wait what side drop is a waggy axle? Narrow trac axles are around 61"
but they are less desirable closed knuckle ft ends. and the MJ frame & wheel wells are already pretty wide even with its wider original axle. Not a deal breaker, but wider would work a little better. There are plenty of things you can do to a HP 30 to beef it up. As was said, stronger axles and U joints, you can also sleeve it internally for extra strength, and as you know, trussing always helps. Combine this with WJ knuckles and brakes and steering, a WJ or late style dual diapragm booster, and an 8.8 with welded tubes and disc brakes, and wheel spacers, I would think youd be all set for what you plan on doing. Good luck, and let us know how it turns out! Is an 8.8 really that narrow? how much wider is a full size 8.8 then? looking around for axles is kinda fun i won't lie. but i def can't wait till i can get back on american soil to hit the pick and pull yards and see what they really have.. thanks for the info. oh for the WJ knuckle conversion. i was reading around and to do it right cost nearly 1000 dollars. so in the end wouldnt a 1/2 or 3/4 ton axle be cheaper after all the upgrades to a 30? what is the WMS measurement on the 30/35s? If you are considering full width axles, spend a little more coin and go 3/4+ ton. A ford D44 HP and D60 combo (F250) would be a little overkill for 35's....but then again they would be one less thing to worry about. You will spend more on the front suspension as the Ford axles are set up for leaf springs, but they are more beefy, already have big brakes and the front is a HP. F250 axles are common and will cost just a touch more than stock Jeep axles in most cases as the F250 guys want F350 axles. 87Warrior: any years to look for? if did do that route, I really don't think I would need any further mod than basically stock for 35's besides locker and gears. I know there are ones that are highly sought after but could there be others that would still work in my favor? I honestly do not know. What little I do know about the Ford D44 I have come across on accident while researching D60's. You will want to make sure what you are looking at isn't a IFS axle and is an actually a straight axle. There is a ton of D44 information on pirate4x4. I would recommend searching, reading and taking notes from that site/forum until you are blue in the face. Blue in the face huh? lol thanks. I have been roaming around over there too. but with extra brackets and all i think my best way to go would be an 8.8 and a hp30. Front is basically bolt in and the rear is just a matter of some perches. thanks for the extra info if i take one step further though..